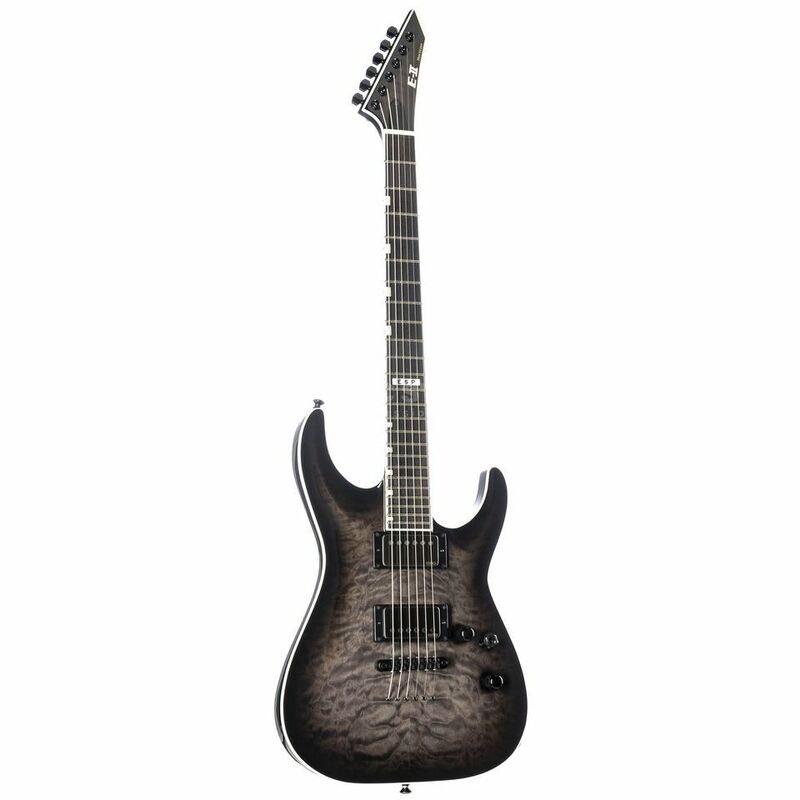 With the ESP E-II Horizon NT-II See Thru Black Sunburst ESP presents an electric guitar made in Japan, which is perfect for modern rock and metal. The classic Horizon design with continuous "Thin U" maple neck offers unimpeded playability up to the high positions of the 24-flush ebony fingerboard, while the EMG 57 and EMG 66 amps feature humbuckers for juicy sounds. High-quality hardware in the form of Gotoh and Schaller completes the ESP E-II Horizon. The ESP E-II Horizon NT-II See Thru Black Sunburst is made in Japan and convinces with high playing comfort and hot sounds. The flowing neck/body transition of the Neck Thru construction allows unimpeded access to the high positions. As a modern electric guitar for rock and metal, the ESP E-II Horizon NT-II naturally offers first-class playing comfort. This is due to the three-piece maple neck, on whose "Thin U"-profile even the most complex riffs and virtuoso solos play themselves. To make sure that you don't lose your orientation, stylish offset dots between the 24 extra jumbo frets of the ebony fingerboard mark the layers. A further optical highlight is the solid cloud maple top on the body wings made of mahogany. The EMG 57/66 set with chic metal works caps promises hot sounds for rock and metal. The ESP E-II Horizon NT-II uses two active EMG humbuckers with precious metal works caps. With its combination of Alnico magnets and pole Pieces made of steel, the EMG 57 delivers a powerful sound at the bridge, which gives riffs and solos with its high midrange presence an enormous assertiveness. The EMG 66 on the neck, on the other hand, convinces with its warm yet transparent sound, which is perfect for singing melodies and glassy clean sounds. Both pickups also convince with a particularly organic dynamics, which is in no way inferior to passive pickups. Gotoh locking mechanisms on the ESP Pointed Headstock promise high tuning stability. In addition, the ESP E-II Horizon offers first-class hardware equipment from Gotoh and Schaller. A Gotoh Tune-O-Matic bridge is used on the body, which guarantees perfect intonation and optimal string position. At the same time, the strings passed through the body behind the bridge promise a high contact pressure on the string riders, which supports the fast response of the electric guitar. From the bridge, the 25.5" scale length (648 mm) strings are directed towards the classic ESP Pointed headstock, on which Gotoh MG-T locking mechanisms promise precise tuning and fast string changes. In addition, the ESP E-II Horizon NT-II offers Schaller Security Locks that hold the guitar securely on the strap. The ESP E-II Horizon NT-II is delivered in the matching ESP case.